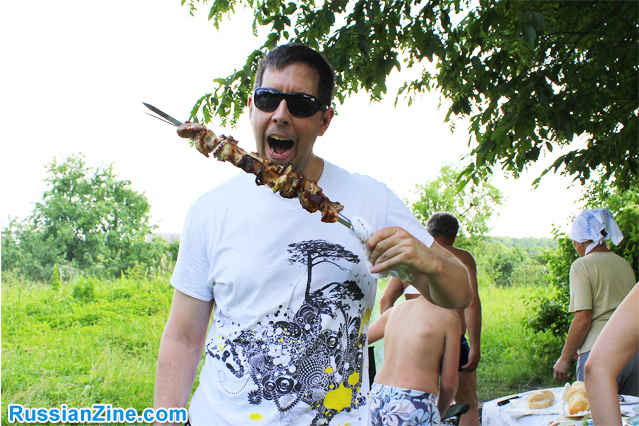 Stay long enough with your Russian friends during the summer, and they will eventually invite you to a Russian-style cookout called shashlik. Everyone packs into a car or two and drives out of the city to the woods. It might be to a designated area of sorts, with picnic tables, but just as often it’s simply to the woods themselves, perhaps by a lake. First tip: Bring OFF or some insect repelling equivalent. After finding a good spot, the women start setting up the eating area, and the men endeavor to build a fire. There’s no charcoal here. This is from scratch. You’ll hunt for twigs, pine-cones and leaves to get things going, eventually topping it off with a few big logs. 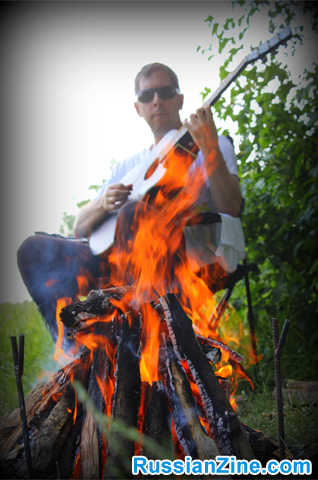 The goal is to get an area of about two feet by two feet of simmering wood embers. Four metal stakes at the corners will support the two main metal beams. And upon those beams go the shishkabob spears themselves, which the women have been loading with marinated pork or chicken, or perhaps lamb, along with peppers and onions. Tip #2: Don’t expect a bathroom. If you’re shy about relieving yourself in the woods, make sure you take care of things before heading out. 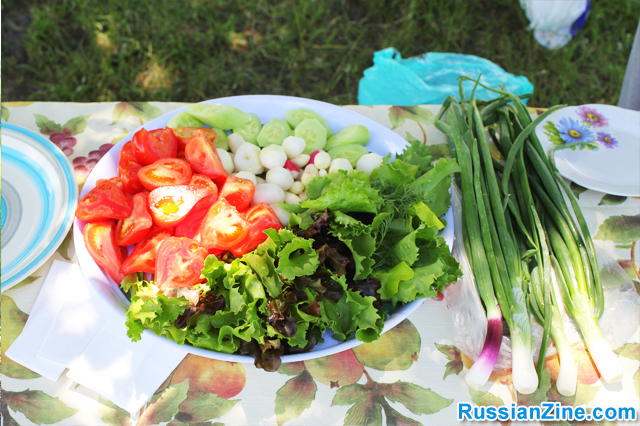 At every shashlik cookout I’ve attended, both in Russia and here in Ukraine, the host also brought fresh fruits and vegetables from their dacha. (To learn about Russian dachas, see my photos and article here.) In all it’s an earthy, smoky, delicious meal. 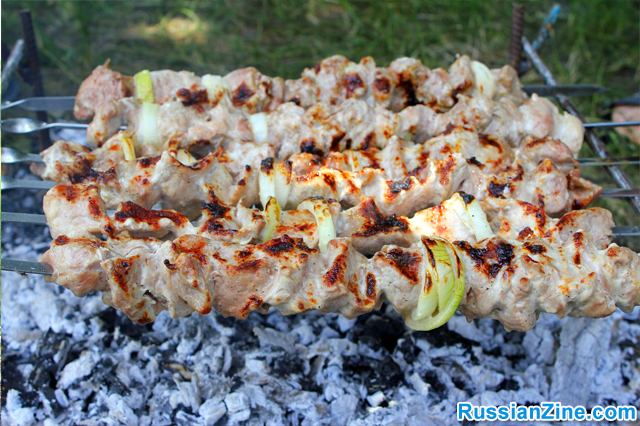 Russians love the shashlik experience. Yes, they mostly live in cities, but that’s out of necessity only. I always get the feeling that they’d prefer to live closer to their roots, off the land itself. It’s simply no longer practical in this day and age. But they certainly love to get out there whenever they can. So be sure to join them with enthusiasm if you’re lucky enough to be invited. Previous: Think you know what a Russian dacha is? 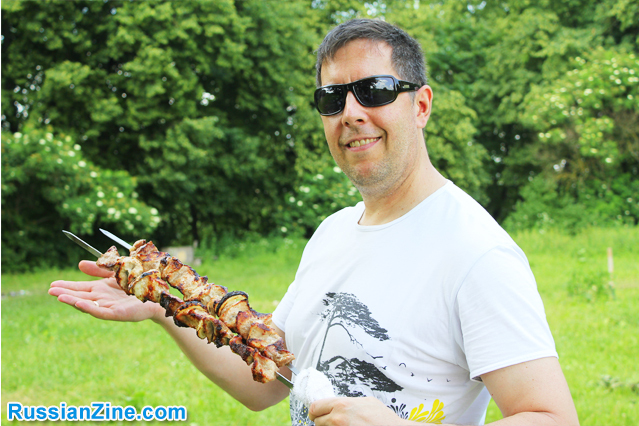 I have been to Russia and had sashlick, it’s the best don’t leave Russia without trying it.!!!! !